Doc Manson is back writing at the B-Movie Geek for SHOCKTOBER 2015! The quest? To watch 31 horror movies in 31 days. Today, we're talking about movie #3, a horror-comedy from New Zealand, Housebound, which is readily available for your consumption via Netflix Instant Streaming. Housebound tells the story of wayward youth, Kylie Bucknell (Morgana O'Reilly), whom, after a botched ATM robbery during the film's opening minutes, finds herself sentenced to house arrest at her mother and step-father's creepy old house in the country. The disaffected youth has some difficulty adjusting to the quiet life back at home and, before Kylie has a chance to settle in, inexplicable happenings begin to occur. Before long it seems that the old country home might have some unwanted guests that never quite managed to vacate the premises after an untimely, violent end - if you get my ghostly drift. I won't go into too many more details about the plot, as the film unfolds into a rather clever and satisfying little tale. Beyond the plot, then, I'd like to mention that the film has the honor of being one of the more subtle horror-comedies that I've seen in some time. Numerous events happen, but unlike a lot of films where slapstick elements rue the day, Housebound manages to keep an understated tone throughout its most humorous scenes. It comes across as a dry sense of humor, maybe unsurprising given the film's country of origin. It was a refreshing change from the more obliquely obvious comedic elements found in most other film's from the horror-comedy genre. I feel like this review is a little short, but it's difficult to talk any more about the film without spoiling some elements of the plot. Given that I enjoyed the storytelling on display, I hesitate to spoil anything more here. 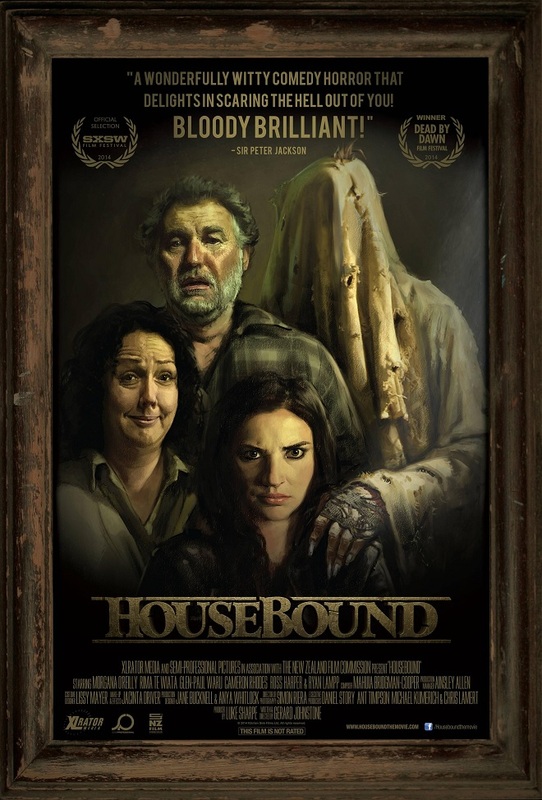 Instead, I think I would encourage you to watch Housebound yourself. It's something of a slow burn, but the subtle humor gives it an energy that you don't often find. The only other thing I'll say is to watch out for that cheese grater. Yeah, it gets used, and it gets used exactly like you think it will.